HELIJET originates from the technology of propeller submersible agitators and, for that reason, is able to create a powerful stream in an area, in order to break the cap or to flood it by suction. HELIJET presents no residual risks; however, during the operations of handling, cleaning and maintenance, you must disarm the principal switch and disconnect the plug from the electric power. You must check periodically the correct condition of the electric cables and electric devices. When running, the engine is submerged in a tank out of user reaching. The electrical risk is ensured by the container conductivity. Possibly, you can proceed to an equipotent check of your equipments. There is no mechanical risk, because even during the cleaning, no part on the move can be reached. Every change or repairing during the warranty period, will be in any case liable to an elaborate examination in our services. However sending expenses will be paid by the customer. The constructor denies all responsibility for a breakdown resulting from the no observance of these instructions or from any non forecast use. Other uses than above, especially when the engine is not completely submerged. If you want to use the HELIJET in a non forecast use, we advise you to enter in relation with us for an eventual issue. Lateral pipes can be used as handles for transport and handling, the pole can be used for suspension and height setting. All pieces can easily be dismantled with help of adjustable toggle joint, it is the reason we advise you to dismantle different elements before any handling or transport, as far as possible. For protection of people and goods, we recommend you to use a differential cut-out, in head of the network, 30 mA gauged. At the end of the box cable, connect a plug adapted to your network. After switching the electric box on, check the rotating movement, with starting up the on switch “forward” (temporised) for a short moment. Propeller rotating sense: anticlockwise seen from the discharge. Put the engine part at the edge of the hatch and suspense it by the suspending hook. Assembly the extension cord first fitted out with the corresponding deflector. Go through the cap and hang the extension cord by the suspension hook. Assembly the suspending pole with the loop and the clip handle (adjust its tightening). When setting obtained, lock the grip with the rotating handle located above. Adjust the deflector higher than the cap according with available height in the tank. If the cap is too high in the chimney, set the deflector lower inside the cap and start a cycle. The cap will go down after a certain time. The norm is that the discharge noticeably goes down until complete vanishing further a certain level. In this kind of use, the discharge may be unpredictable. Set the Venturi cone at the discharge of the HELIJET (a thrust stops it at a certain depth), screw the wiredrawn elbow tight in the tapped join, in order to block the cone. Adjust the flow by the way of the setting tap. In all these operations, it may be possible that occurs a decreasing or a lack of flow. This is the consequence of the grate plugging. This can be reduced by reverse impulse. When restarting, the timer will however start again its cycle according with its order. Present the HELIJET as shown in 8a. Drop the HELIJET with the pole inside the cap, turn possibly the unity when correcting the height. During the incompact, the flow often decreases suddenly. That shows merely that the operation has been made successfully. ( the berries that were plugging up the grate went down in the tank). Set the suspension pole according with the expected result (0°, 45°) near the engine to obtain a better balance. Present the engine part, discharge to the bottom, and adjust the height with the suspension pole. Be careful; in certain cases the flow in the beginning can cause light overflowing. It is advised in these cases to drain the tank a little. To homogenize lees before pumping, we advise you to set the HELIJET higher than possible in a tank with a 0 to 45° inclination from the pole. The complete length of the pipe depends of the total height between the tank and the ground, in the beginning of the chimney. This length has to take in account the filling height, the height under ceiling and the theoretic height of the marc top. The principle is to go and collect the juice not too close from the constituted marc top and not too close from the bottom because of, between other things, pips. Standard lengths are 1500/2000/2500 and 3000. According with obtained result, choose the closer pipe. The maximum length allows realising all operations in tanks, which capacities are more than 4500 m high. Set the pipe before or just after the filling part. Hook the pipe by the upper hook, present the pole with the deflector, and tighten the two fixing screws. Hook on the tank edge with the suspension device. Between two operations, it is advised to let the diffuser pinned on the end of the pipe, in order to avoid any penetration of marc inside. Present the engine part with cable seating in direction of guiding groove. Let the engine go down in the pipe until it reached the bottom. If some marc entered the pipe, avoiding the engine to go down, it is possible to start the propeller forward. Connect the male plug in the command box and adjust the dimmer on 5 or 6 position, and start a cycle. If this operation is unsuccessful, you must extract the pipe to unplug it. - higher than the marc top and the deflector, that has been set closer for suction. - lower than the marc top and the deflector, that has been taken away for incompact. The duration of the cycle depends of the tank capacity and the operation to realise. 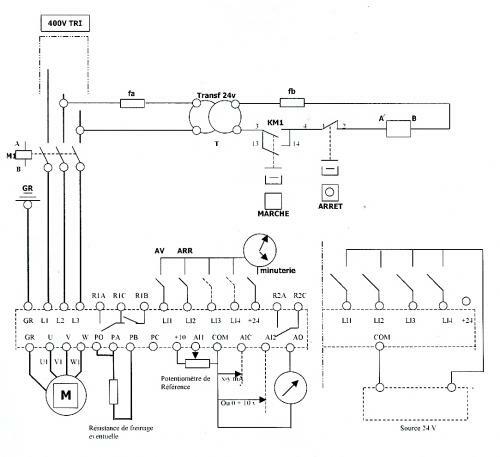 The maximum flow in fermenting phase, can reach 2000 HL/H. This flow is considerably reduced in pre fermenting phases. Set the fixing clamping ring around the engine, about in the middle of it, point the sector according with wished angle. Hook the suspension pole on the edge of the hatch at wished height. Start a cycle with programming time and height of the dimmer. Pay attention that, in certain cases of stick forming and in presence of gas, a sudden emulsion may happen, causing tank overflowing. We advise you to start slowly (that means 3 or 4 on dimmer switch) and progressively increase, when waiting some seconds between each increasing. We warn you against the risks, especially electric, incurred by any non entitled person. All non agreed intervention will cause the loss of the warranty and degage the constructor of his responsibility. Check the HELIJET immersion deepness (in case of relieving, incompact or recent filling: normal). If the HELIJET does not run after checking all breakdowns causes, please contact the closer retailer or after sale service. NB: the programmed time will not be taken in account by the timer. It will be added by the timer to the programmed time.